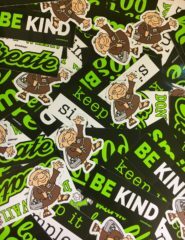 Ned’s Mission: Changing the world, one sticker at a time. 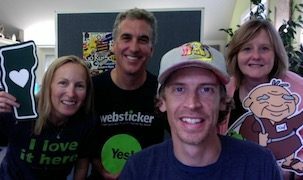 Ned can only do so much on his own, so he created the NedSayz community to help him spread simple messages and smiles. Stickers are the lowest-cost, highest impact way to make impressions and start conversations. And, with all the negative news & media, it is more important than ever to spread good vibes. Do you want to get involved and help make the World a better place? Of course you do. Order up some stickers below and get sticking! And, by popular demand we now have “I Love It Here” t-shirts. Don’t forget to tag Ned on Instagram @NedSayz to share your slaps with the community. You can also read more about Ned and his positive stickers. Ned’s Free Sticker Pack – A handful of Ned & NedSayz stickers. We’re not really making money with this, but do need to charge a little something to cover shipping and a bit of handling – hopefully that’s cool with you.